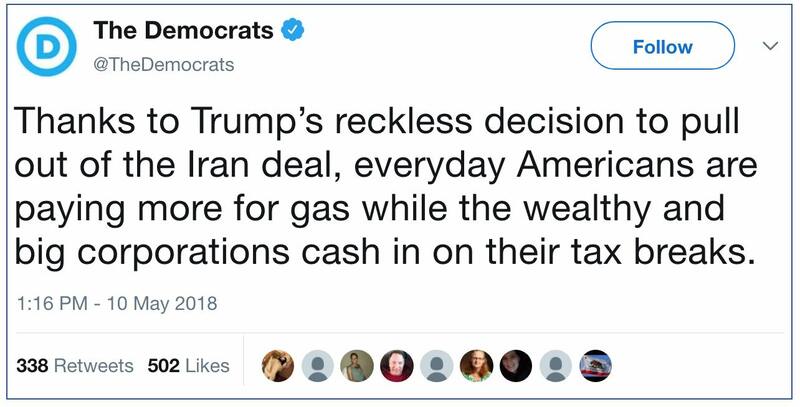 Media outlets been hyping the recent increase in retail gas prices to nearly $3 per gallon, and primarily pinning the blame on President Trump's withdrawal from the Iran nuclear "deal." 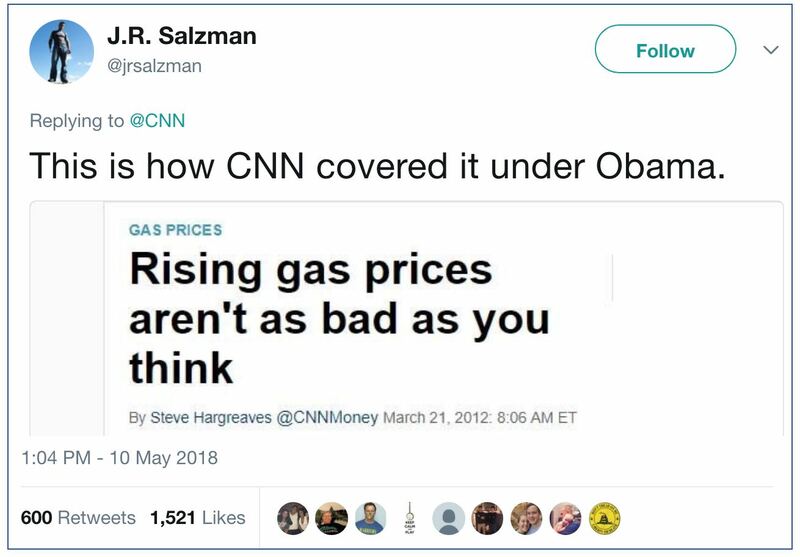 In 2012, when the price approached $4, CNN told readers that they "aren't as bad as you think," and that they weren't "a big drag on the economy" — and besides, according to the New York Times, "Gas prices are out of any president’s control." 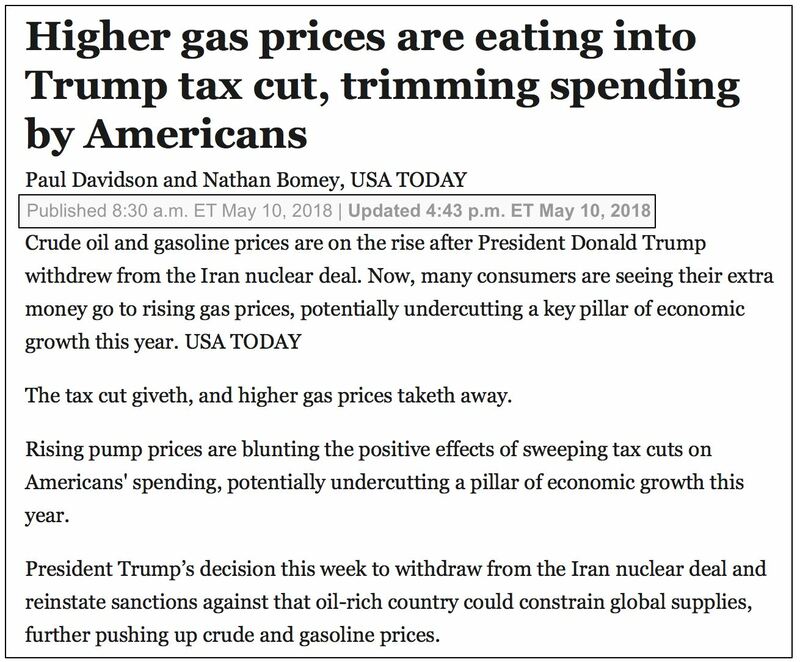 CNN conveniently "forgot" that prices topped $100 per barrel several times every year from 2011 to 2014. Retail prices also hit the $4 a gallon "milestone" in many states in 2011 and 2012. Friday at CNBC, Patti Domm bullet-point headlined a claim that "the average family" — not merely some families — "could pay several hundred dollars more for fuel ... (from) May through September." In Domm's story, she wrote that an "average" family "could pay about $1,318 for gasoline from May through September, compared to $1,070 ... a year ago" — a difference of $248. Domm eventually cited "the continued decline of Venezuela's oil production" as a factor — a point CNN, USA Today, and most other press reports have ignored, including a Sunday CBS Evening News item. In addition to the virtual blackout on tagging Venezuela's workers' paradise turned nightmare as "socialist," the press would rather not discuss the impact of that country's oil-industry implosion, covered in a Saturday evening NewsBusters post, on worldwide prices. Venezuela's daily oil production has fallen by 40 percent since the end of 2015, from 2.5 million barrels a day to 1.5 million. Half of that decline has occurred in the past seven months. The nation's oilfields are in such disrepair that steep output declines will almost certainly continue. This kind of falloff for a commodity like oil, which is very price-inelastic, can't help but push prices up. Iran would have to cut its daily oil production by about 25 percent to have a similar impact. There's another key point which the press steadfastly refuses to acknowledge, namely that increases in U.S. production have made up for most of the shortfalls seen in Venezuela and other strife-torn countries. Imagine how much higher gas prices might be if U.S. monthly crude production hadn't increased by almost 1.5 million barrels per day during the past 14 months.